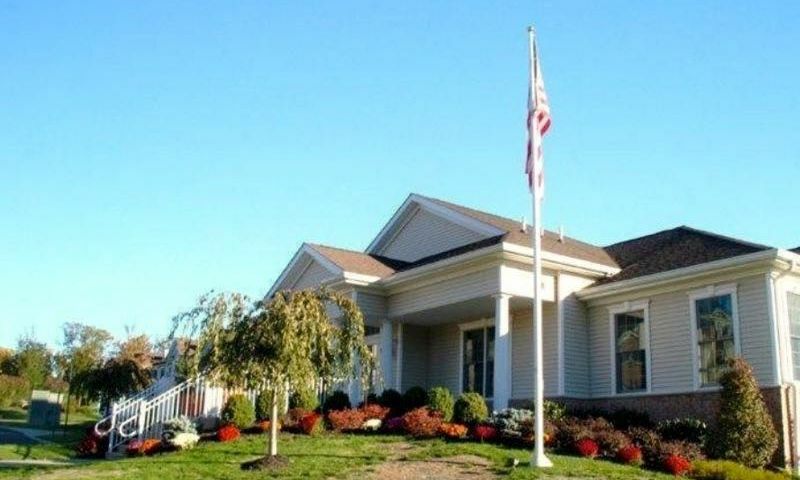 Horizons at Mount Arlington is an active adult community in Morris County, NJ. Developed between 2004 and 2005, Horizons at Mount Arlington contains 144 condominium units, some of which are available on a resale-only basis. Homeowners regularly gather in the clubhouse to stay socially active or enjoy some friendly competition on the sports courts. Horizons at Mount Arlington is a perfect community for active adults who love outdoor recreation because it's next door to a wildlife park and walking distance to Lake Hopatcong. 55+ homebuyers in Northern New Jersey will love all that Horizons at Mount Arlington has to offer. At the center of the community is a beautiful clubhouse. A meeting room is available for neighborhood events, while a catering kitchen is ideal for preparing a quick snack for friends. Residents also gather around the card or billiards tables for games on leisurely afternoons. An exercise room helps homeowners say goodbye to expensive gym fees. Horizons at Mount Arlington also provides several ways to make the most of the warmer months with an outdoor pool and patio. Just behind the clubhouse is a shuffleboard, bocce ball, and tennis court for some fun ways to exercise. There are also walking and biking trails throughout this scenic 55+ community. Horizons at Mount Arlington was developed between 2004 and 2005 and has 144 beautiful units. These units range in size from 1,467 to 1,867 square feet and offer two bedrooms, two bathrooms, and underground garage parking. Some units boast cherry cabinets, hardwood floors, and granite countertops. Living within Horizons at Mount Arlington also gives residents more time to do as they please because the homeowners' association takes care of snow and trash removal, as well as exterior building maintenance. Homeowners are constantly gathering for fun events and activities in Horizons at Mount Arlington. There are organized games of bridge, canasta, Mah Jongg, and poker. Getting to know your new neighbors is easy with holiday parties, ice cream socials, brunches, and even an Irish night. Stay in terrific shape with water aerobics, water volleyball, or tennis. There is something for all interests in Horizons at Mount Arlington. Horizons at Mount Arlington is located in Mount Arlington, New Jersey. Just down the street on Howard Boulevard are plentiful restaurants, a pharmacy, and banks. Six miles from Horizons at Mount Arlington are several other stores including a ShopRite, Walmart, Home Depot, and Costco. Interstate 80 is conveniently nearby for traveling across the area while for farther travel, Newark Liberty International Airport is about 40 miles away. Outdoor opportunities are nearly endless around Horizons at Mount Arlington. The community is just off the shore of Lake Hopatcong, New Jersey's largest lake, and the Berkshire Valley State Wildlife Area is across the street, featuring 2,030 acres of wetlands and forest. Big-city entertainment is just a short drive away in New York City. Horizons at Mount Arlington provides the conveniences of a big city next to outdoor recreation in Northern New Jersey. There are plenty of activities available in Horizons at Mount Arlington. Here is a sample of some of the clubs, activities and classes offered here. Horizons at Mount Arlington was developed between 2004 and 2005 and had 144 beautiful units upon completion. These units range in size from 1,467 to 1,867 square feet and offer two bedrooms, two bathrooms, and underground garage parking. Some units boast cherry cabinets, hardwood floors, and granite countertops. Please Note: Not all floor plans are available at this time. 55places.com is not affiliated with the developer(s) or homeowners association of Horizons at Mount Arlington. The information you submit is distributed to a 55places.com Partner Agent, who is a licensed real estate agent. The information regarding Horizons at Mount Arlington has not been verified or approved by the developer or homeowners association. Please verify all information prior to purchasing. 55places.com is not responsible for any errors regarding the information displayed on this website.